"Angels" showed sparkling dance. Audience were touched with hopeful smiles. SPAC is the Shizuoka Performing Arts Center, the pioneer of publicity-funded performing arts organization in Japan. 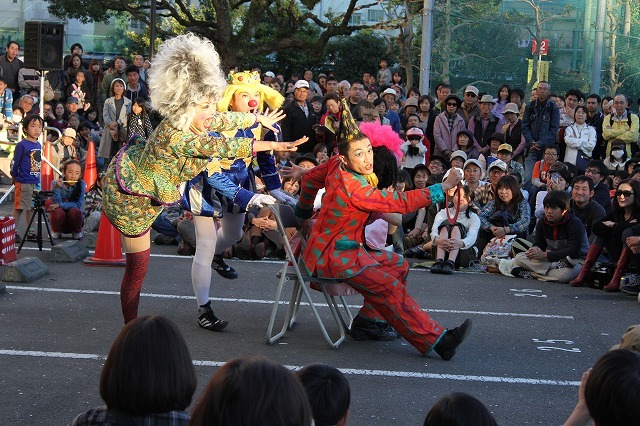 Actors and staffs are employed by public foundation of Shizuoka prefecture. One of the masterpieces of SPAC is "Mahabharata (directed by Miyagi Satoshi)" which has been performed various places all around the world. SPAC started the project for teenagers "SPAC-ENFANTS" in 2010 with Merlin Nyakum, a Cameroonian dancer and choreographer. The project purposes that world's teenagers find their hope for the future via dance. so director hope that participating dancers open and express their chalacters. 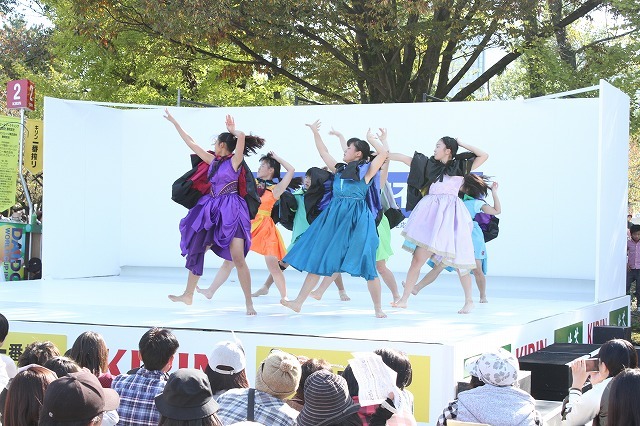 Furthermore, he also want to connect the young dancers in Shizuoka to the wide world. Every two years, around 10 teenagers are auditioned. The choreographer creates the piece looking at their indivisual chalacters. They reveal the project at Shizuoka Performing Arts Park in Nihondaira. 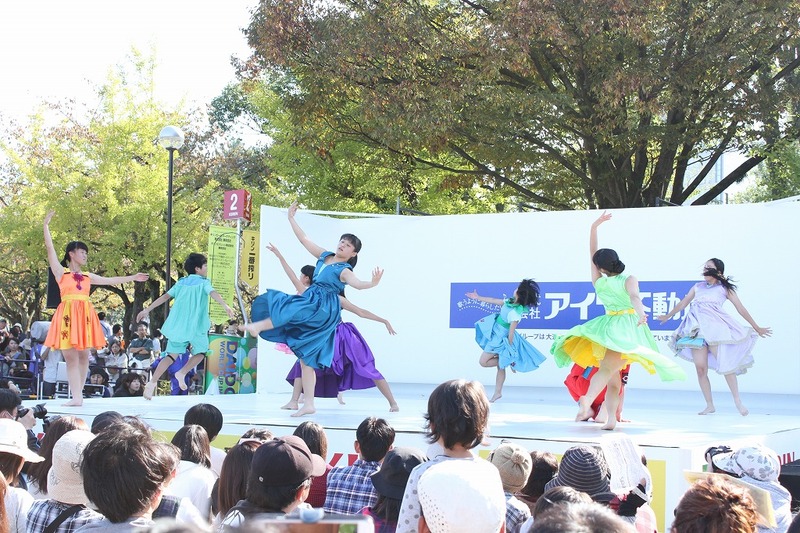 but San Yoshida, one of the dancers, told us that they want to get more opportunities to perfom in various places. San had been taking lessons of ballet since she was a child, then she survived the audition of SPAC-ENFANTS. It was a casual try. She didn't think to get involved in the project at that time. After 4 years, she became an attractive dancer and now she is planning to participate in the workshop in Cameroon. She was successfully connected to the wolrd via the project. 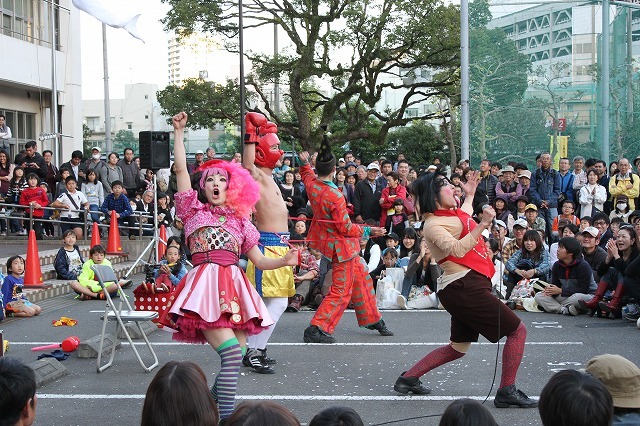 In this festival, audience found the newpleasure to enjoy the progress of close small artists in Shizuoka. The new project "Round Table"
The committee held an official "Round Table" for the first time in this festival. and directors demonstrate their festivals to artists. 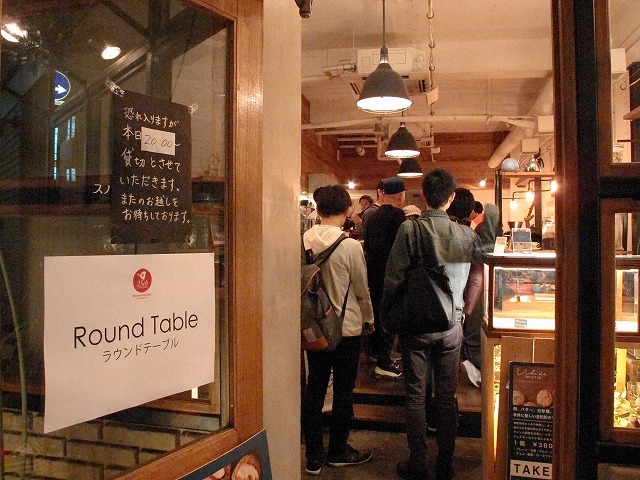 In other words, the Round Table is a messe where directors discover attractive artists. 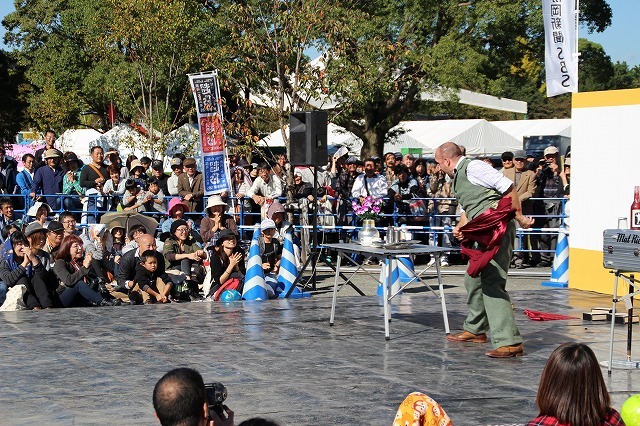 Such messes are actively held in international festivals abroad, but no precedent in Japan. The committee wants the Round Table to provide opportunities of performing abroad for more artists. This new approach was subvented by Shizuoka city and it will be held next year and beyond. May lots of artists receive impulses from the Round Table and find their way into all over the world. 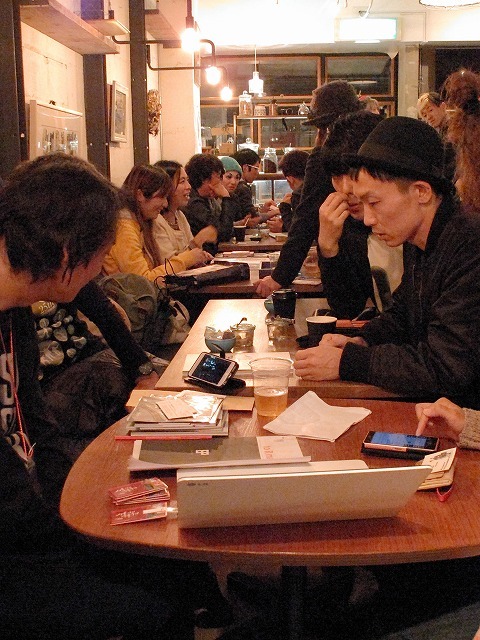 By the way, it's very difficult to distinguish the artists without makeup or costume. His performance starts in quiet heart break. Grief gradually disappears in a rhythmic pace. Children are fascinated with the rhythm and starts to laugh. Pantomime and hut juggling set the mood for his masterpiece "Hello, Goodbye". Lyrics dance in his hands as if they are living. His performance ends in quiet hope. All of his act is sophisticated and fit in soothing music. We can find beauty of form like Noh and beauty of simplicity like tea ceremony from his performance. A gentleman has come from England. His name, Mat Ricardo! The gentleman, with his necessary lucky hat and a cigar, gave a very COOL performance. In fact, I think we can say he gave a cool, cooler, coolest performance! In fact, he has a trick that only he can perform! It:s called the Fast Tablecloth Pull Back! Wait, but isn't Sakai Masaaki also famous for that? Well, the difference is, he not only pulls the tablecloth out, but also puts it back! On top of that, Mat taught Sakai how to do the table cloth trick. For his finishing act, mat always performs his table cloth trick which has taken him 10 years to master. Come check out the trick that only Mat can do! As for Mat's message to his audience? He's happy that everyone here is very warm and friendly! The rebirth of "to R mansion"! Welcome to their strange and curious world! This 4 person colorful and eye catching comedy group grabs the adience's attention from the very beginning. From children to adults, in a single moment they grab the attention of everyone in the vicinity. That group is "to R mansion! "Their performance is loved, not only in Japan, but throughout the world! Pantomime, acrobatics, magic! Their comedy incorporates all of these and more and, like a roller coaster, rapidly changes from one scene to the next! Watch in anticipation of fresh new surprises, wonder what will come next, and look forward to how they will astound the audience next. They continue to raise the excitement of the audience throughout. The audience will find themselves unable to distingquish at what point they found themselves to have completely joined their strange and curious world. This year, they chose a theme befitting of autumn, "Cinema Paradise." There's a plentiful variety of scenes from those resembling old horror films to fresh new ideas. You won't want to miss it! This year, new member Mohammad Alacard has joined their troup and as such this year's performance will captivate the audience in new ways! Be sure to enjoy "to R mansion's"at this year's festival! Come see it in Shizuoka! Their world will be expanded to include 8 membors. 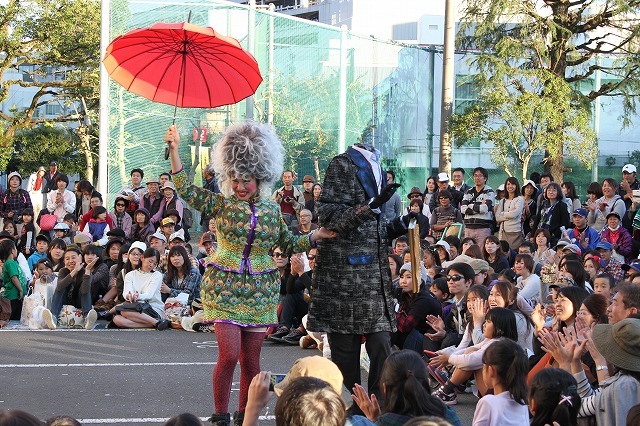 Enjoy a new performance that varies from their street performance style! For location and tickets, please visit their website to R mansion. The November 5th Premium Show Tickets are on sale now! Today's (11/5) Premium Show Tickets are for both the morning and afternoon show are now on sale. A lovely kimono clad woman transforms into a bewitching woman. In a fusion of classic techniques and pole dancing, she performs the story of Yaoya Oshichi. It's a story of a young girl who longs to meet a loved one and ends up sentenced for arson. As a middle school student, Meriko learned the story of this girl, roughly the same age as herself, and was impacted by the story of her burning love which caused her to commit arson due to her passion. The story has always remained with her. Combining pole dance and Japanese dance style, she created her own image of Oshichi. She paints a vivid image of Oshichi's passion as she spins around the pole. What kind of man was it that derailed Oshichi's life? What do you think of her punishment? Many wild ideas pop into your head as you watch Meriko's dance. With the fire and the flames of her passion, it's possible that she was able to make her ascenion. As she finished her dance, a calm and gentle smile crossed her face and, if you look closely at her slender figure, you could see the muscles in her abdomen and limbs clearly defined. When asked about her work, she said "I want to create pole dance scenes which no one has every scene before, so please look forward to it." He's 2 meters tall and handsome. Why is he a comedian? "Because it's the basics of who I am. I want everyone to smile!" was his immediate answer. His humor, however, is a wee bit, shall we say, dark? He kills Rapunzel, throws Little Red Riding Hood and yet, the audience falls into laughter. 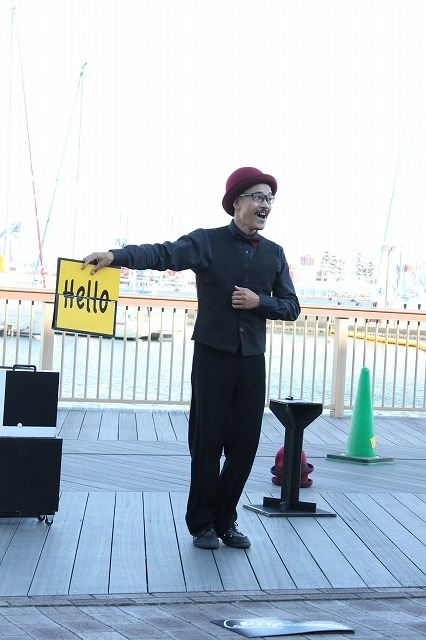 With a history as a comedic actor, he uses hardly any props but instead performs using his voice and body movements. You'd think he'd pantomime and use a doll while changing his voice, but instead, by only changing his voice his can make an image appear before the audience's eyes. He acts out a strong man and a wishy-washy man who is challenged to a duel. The result...? He draws a bow again and again, but it doesn't reach the target. Where does it finally strike...? He runs humorously here and there, his long limbs wiggling. Even knowing what would happen, seeing this, you would laugh time and again. With a large repetoire, his performance changes during each of his apperances, so you can enjoy a variety of acts during each performance! Since coming to Shizuoka, he's even added acts to his repetoire! You won't want to miss a single performance! As this is his first time in Japan, he wants to visit meany beautiful places! 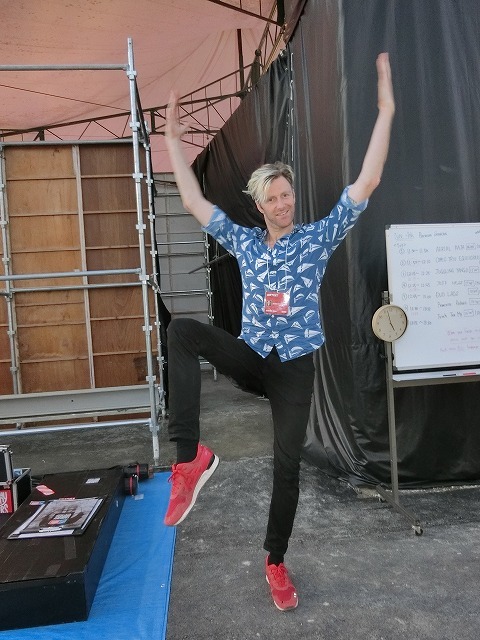 His special funny pose is sure to cause a roar of laughter all throughout Daidogei! 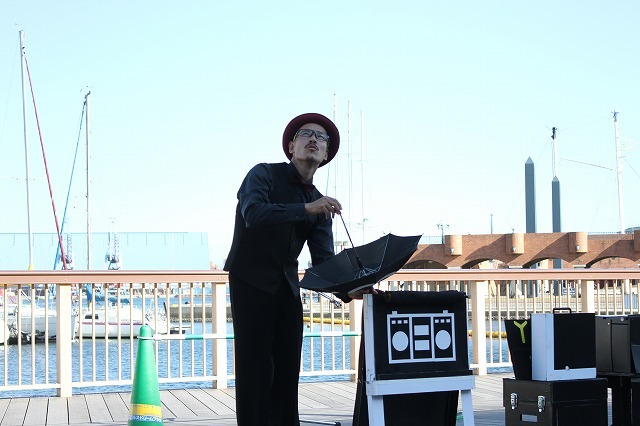 A world juggling champion, Yuusaku Mochizuki's performance includes tap dance and diabolo juggling in the daytime and is intensified by the use of visuals and sound effects after dark. 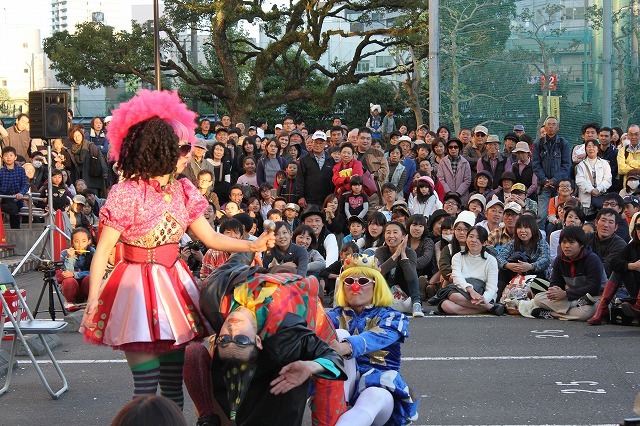 To be able to see such a performance here is Shizuoka is a spectacular opportunity. 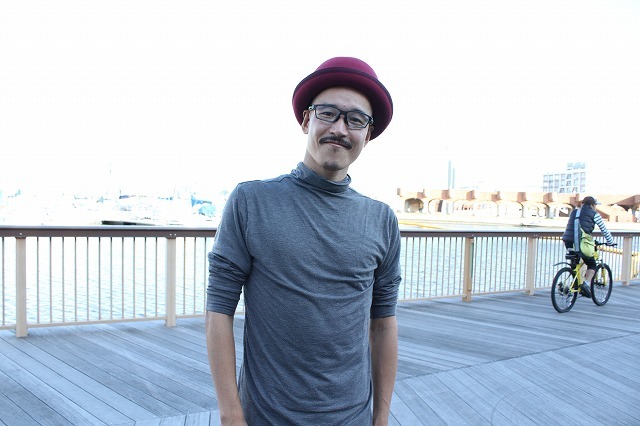 At Daidogei this year, he has decided to try new and different things and will be performing three different types of shows for us. It will be fun to watch no matter how many times you see it. In the midst of our changing world, his work takes elements of every day feelings, good and bad discomfort and combines them in his juggling. What emotions will his performance evoke each time? Enjoy watching while you find out! 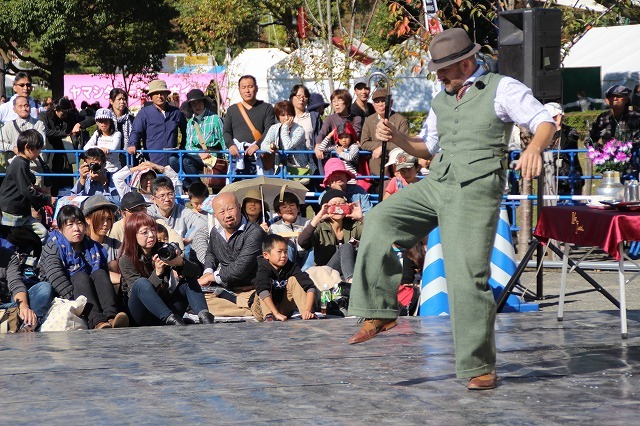 Today, we covered his daytime tap dance and diabolo juggling performance. Despite being a weekday, a large crowd gathered in anticipation of his performance titled "Not White, Not Black." 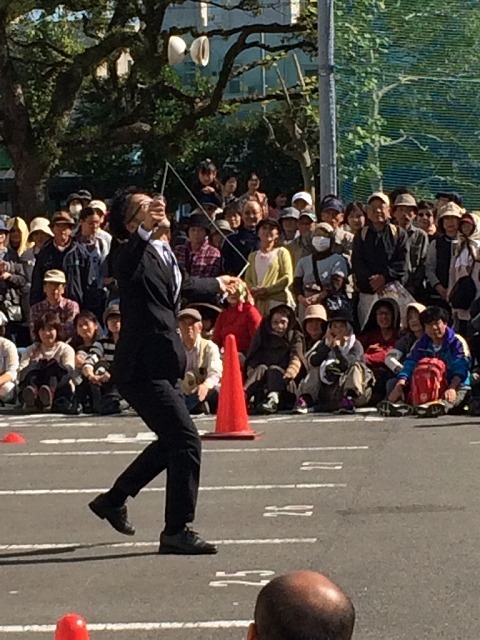 His diabolo juggling and music began, greeted by the applause of suit-clad businessmen gathered in the audience. 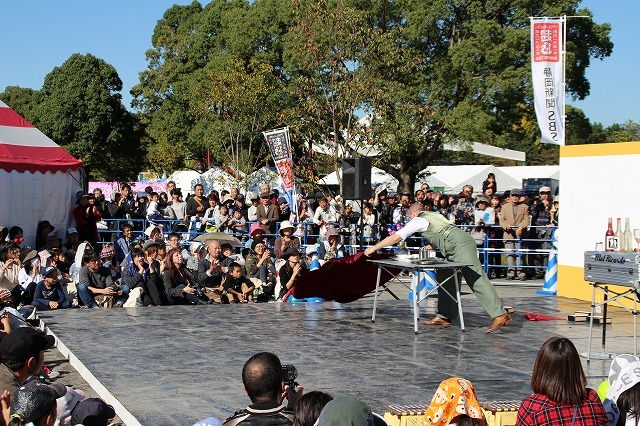 With large movements, tosses and even one handed juggling, it was impossible to take your eyes off of him. His costume and movement changes left the audience in awe throughout his performance. 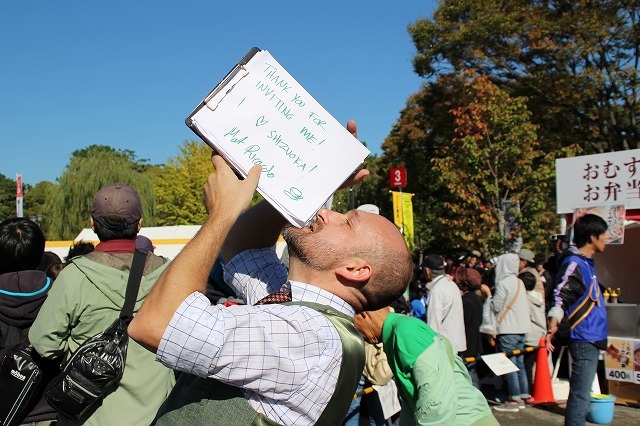 Yuusaku, a Shizuoka native, gave this message to his audience. "I'm glad that everyone at the (Daidogei) World Cup always enjoys my performances. It's an honor to be able to perform in Shizuoka every year." Make sure to check out his performance at this year's Daidogei! You don't want to miss out to watch these great performers!! You will not believe that they dance tango and do juggling at the same time. Not only that, their dance is so attractive and the juggling is in really high level. Menno and Emily are a married couple who has been performing together for 9 years. But they always try to look fresh to the audience, they said. I can see that they really succeed in this area because their performance is so ramantic as if they have just met. There is always a hard part to achieve as a performer. They said combination of the dance and juggling is challenging as they have to do everything so precisely. They dance and juggle so close to each other that even a little more distance would not make the dance look as good. For that high-leveled performance, they practice a lot. Their beautiful bodies tell us that. This is their first time to be in Japan. They really enjoy performing here. Meno has been dreaming to become a performer since he was 3 years old. And performing at this Daidogei World Cup have been their dream. They said they are really happy to be here.